Short answer: Small groups of people meeting in homes mid-week. We believe that small groups are essential for the life of a flourishing, healthy church, and a great place to grow in our faith, and we encourage everyone to join. In our groups we can learn more about God, each other, and the community we live in. This is the setting in which we can share our lives with others and receive the support and encouragement that we need as Christians. In each group we try to get to grips with a book of the Bible or an issue that will help us in our faith or service of God. We pray together (you don’t have to pray aloud) and share any matters of concern. Meet weekly on a Tuesday morning from10am to 12noon.Currently meeting at 119 Winchester Street. This is a group of women of all ages meeting for bible study, prayer and fellowship. Meets weekly on a Tuesday evening at 7.30pm at various locations. 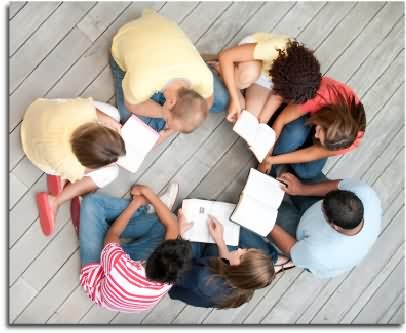 A mixed group who enjoy bible study, prayer, fun and social activity together. Meeting weekly on a Tuesday evening at various locations. A mix of bible study, discussion and prayer. A group formed mainly from people who have attended a recent Alpha Course. Meets weekly on Tuesday evenings at 8pm. A mixed group with a spread of ages. Meets weekly on a Wednesday morning at 9am at various locations. A group of women from various churches. A lively mix of study, discussion and prayer. Meets fortnightly on a Thursday afternoon at 2:30pm at 52 Woodlands and other members homes from time to time. Meeting weekly on a Thursday evening at 7.30pm at various locations. A mixed group of all ages. Leadership of group meetings is shared by various members of the group. A mix of bible study, discussion, prayer and worship. Contact the Home Group Leaders or David Spencer (773649) if you would like to join a group .